The Twigs' team plans to open its 10th location in the summer of 2017. Floating above the atrium of River Park Square, tables full of people converse over their meals while looking out at the corner of Main Street and Post Street downtown. 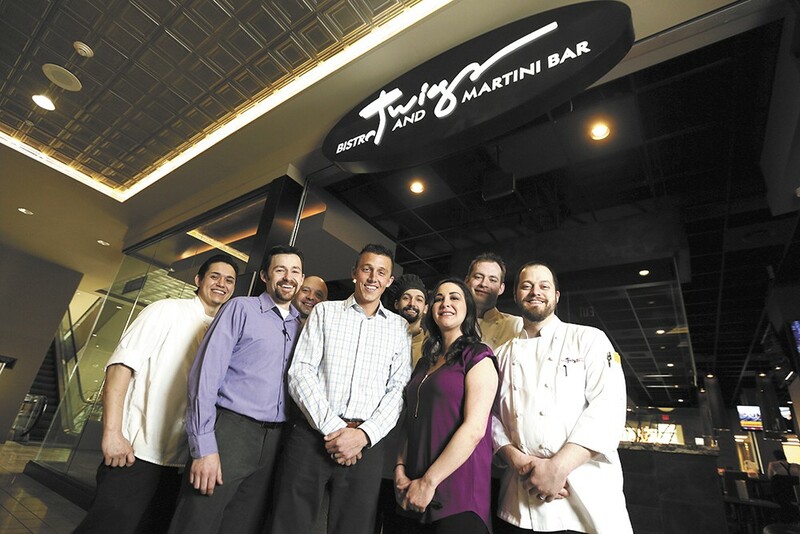 Twigs Bistro & Martini bar began as a small bar in the corner of the food court back in 2001, but has since transformed into what co-owner Trevor Blackwell views as a full dining experience unlike any other in Spokane. Not to mention there are now eight other Twigs locations. Though originally Twigs was heavily cocktail-focused, it's evolved into a restaurant consistently delivering not only fresh and unique cocktails, but dishes as well. "We serve comfortable American cuisine in an open and inviting atmosphere," says Blackwell. "No matter which location you walk into." The success Twigs has seen at its four Spokane spots has encouraged its expansion to Kennewick, Utah, Idaho and Oregon, along with earning Twigs a place in the Best Of Hall of Fame this year. Blackwell hopes that guests feel at home: "It isn't just a place to take the family for a fancy birthday dinner, but rather for afternoon appetizers and a drink or dinner." Beyond classic and private dining options, each location offers martini classes, where groups of 12 or more can learn how to concoct, shake and pour their own martinis. Tips for appetizer pairings — along with taste tests — also are included. Continuing to expand outside the Spokane market, Twigs recently announced plans to open its 10th location, in Vancouver, Washington, in the summer of 2017. Blackwell hopes to have two or three other new locations open in the next few years, including a couple further south. Though Blackwell admits that opening restaurants outside the Inland Northwest demands organization and efficiency, he feels fortunate to have found employees — both on-site and as a part of corporate — who continue to provide the same original Twigs experience that began in the food court to every new location since.